This morning on my way to the gym, it smelled like spring outside. I was all bundled up with my wool coat and scarf wrapped around my neck twice, but something seemed different. The air was warmer and possibly even a little more humid than usual. It smelled like early morning in the summer before the sun has reached its peak. 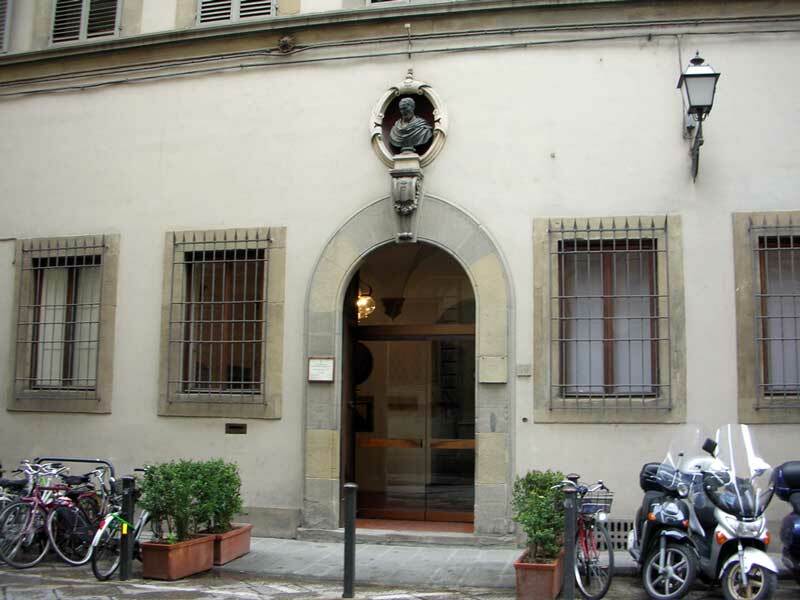 I'm embarrassed to admit that I live about a block from Casa Buonarroti (Michelangelo's house) and I only just visited it today for the first time. I walk past it many times a week to go to the gym, the grocery store, and the alimentari (corner grocer) that is right across the street from it. I made a point this morning of getting out of the house early enough to go for a visit, especially since it was one of a few museums open on Mondays. Today is the beginning of l'anno del cane di fuoco (Year of the Fire Dog) and to celebrate Dave and I went to a Chinese restaurant. There is actually only one Chinese restaurant I like in Florence, named "Osir", but because of the rain, I didn't want to go to viale Lavagnini, which is on the other side of town. I actually haven't been there since Dave and I moved here. Last year we were often cold in our apartment. Our building is quite old so we're not lucky enough to have riscaldamento centralizzato (central heating), which consists of radiators installed throughout the apartment. We have riscaldamento autonomo (autonomous heating), which basically means you have to fend for yourself. We have a few heaters/air conditioners installed high on the wall, but we don't use them any more because the heat only goes higher and the air is still cold. This afternoon while I had a break from work, I thought I'd go and visit a museum and take some pictures. As I looked at the list of museums that I want to visit, I realized that they were all closed in the afternoon. 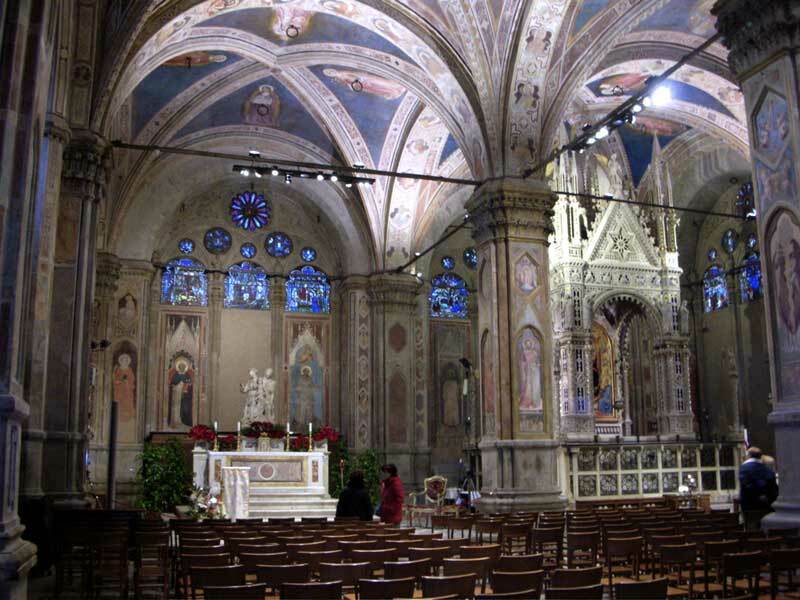 There were only two that I wanted to try to visit today: Casa di Dante and Galleria dell'Accademia. I decided to walk toward Piazza San Marco, where I took the picture shown here, before it got dark. During the week between Christmas and New Year's, the post office was open; however, we didn't get any mail at all. I'm sure business was slow during the holidays and some people took the entire week off, but we only got mail once during that entire week. I love receiving letters in the mail even though I keep in contact with almost everyone via email. 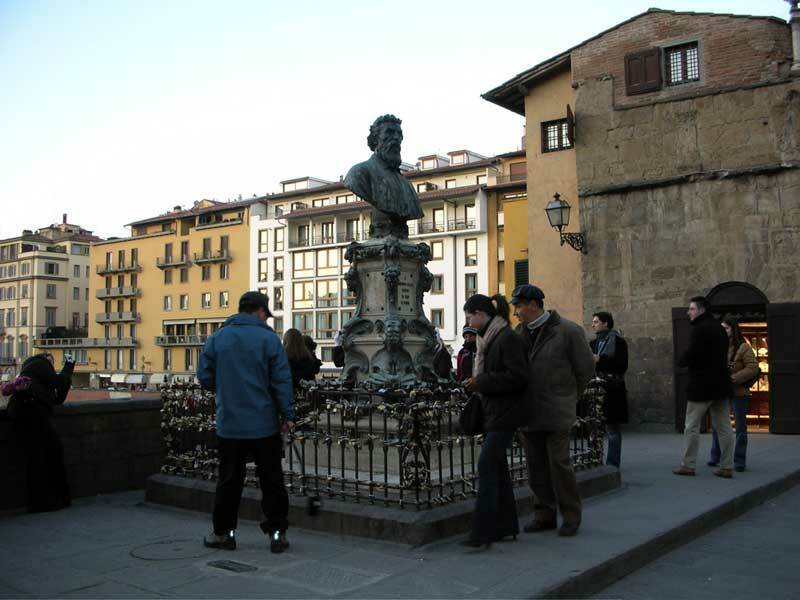 Mondays are interesting in Florence: many shops don't open until after lunch, a few restaurants don't even open, and quite a few museums are closed. Monday is one of those slow-to-start-the-week days. The mercato (market) and the supermercati (supermarkets) are open, but they're not that busy. A friend of mine sent me a crystal that I asked her to buy me in the US. It didn't arrive until after I left so I asked her to send it to me in Italy. Normally, things come fairly quickly between 3-10 days by standard mail. She called me last Saturday to tell me that she just sent it to me, but failed to mention that she was sending it via FedEx. After living here for quite some time, I finally realized the other day that almost every street in downtown Florence is senso unico (one-way). There are only a handful of two-way streets, like via Cavour, via dei Cerratani (both near the Duomo) and the viali (avenues) that delimit the centro (downtown center). Buses always go in the specified direction, cars generally do, and biciclette (bicycles) and motorini (scooters) rarely do. Finally, the sun came out to shine today. After staying in all day yesterday, I couldn't wait to get outside. 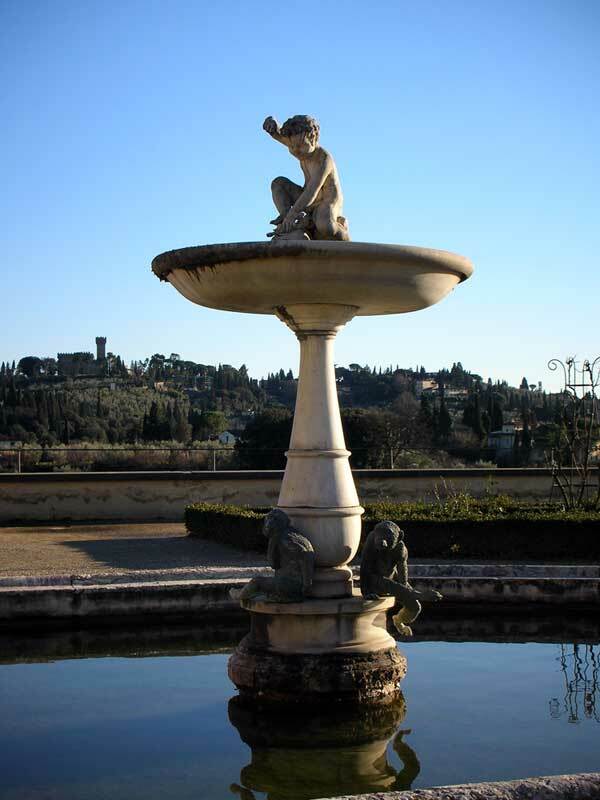 I had planned on visiting friends at their house today, but instead we decided to meet at the Giardino di Boboli (Boboli Gardens) behind Palazzo Pitti. My friend has three kids and they needed some time in the sun and fresh air. With my tessera (card), I'm allowed to go to the gardens as well as museums all year long for free. It is such a treat to visit anything I want multiple times. And especially now when the city is rather quiet. 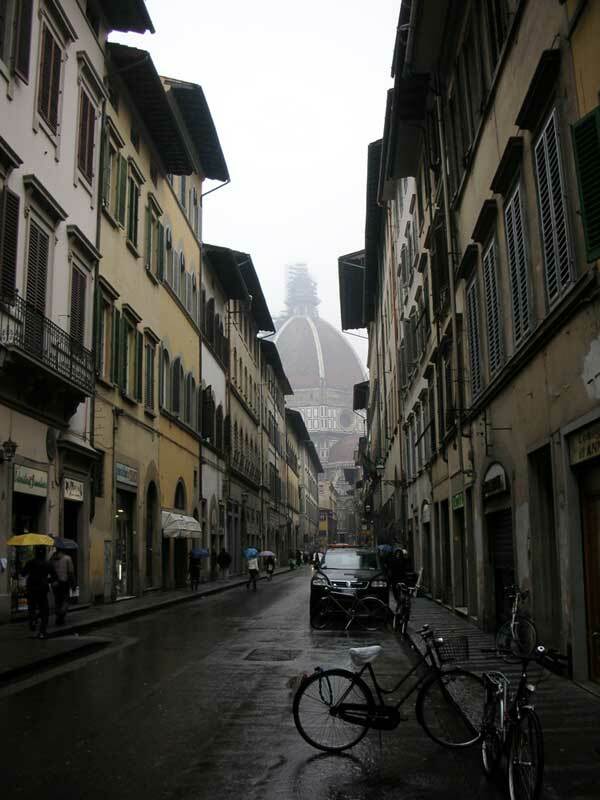 Another rainy day in Florence. We were so lucky to have sunny skies for almost two full weeks and then Monday it began to rain. Not a lot of rain, but continuous rain. The kind that gets the front of you wet when you're walking. Today, Dave and I vowed we wouldn't leave our apartment. We've been outside two days in a row going downtown for various reasons. We had planned on going out to eat sushi at another Japanese restaurant in via dei Neri, but decided to go another day. We didn't feel like going outside in the never-ending rain. I don't keep track of the bills to pay because they seem to come every few months without fail. All of them usually give me a few weeks to pay, except SKY (which is our Italian Satellite TV company) where I usually have only a few days. I received a letter last week from SKY telling me that I didn't pay my bill and that I needed to go to a ricevitoria SISAL (SISAL receiving office) to pay. I knew that I couldn't pay on the phone because they only accept Italian credit or bank cards. So, when I called SKY, they gave me three addresses of which the only one I knew for sure was the one I went to last year to pay for the SKY installation. The woman told me to pay both bills, the past one and the next one that I haven't yet received and is due at the end of the month. 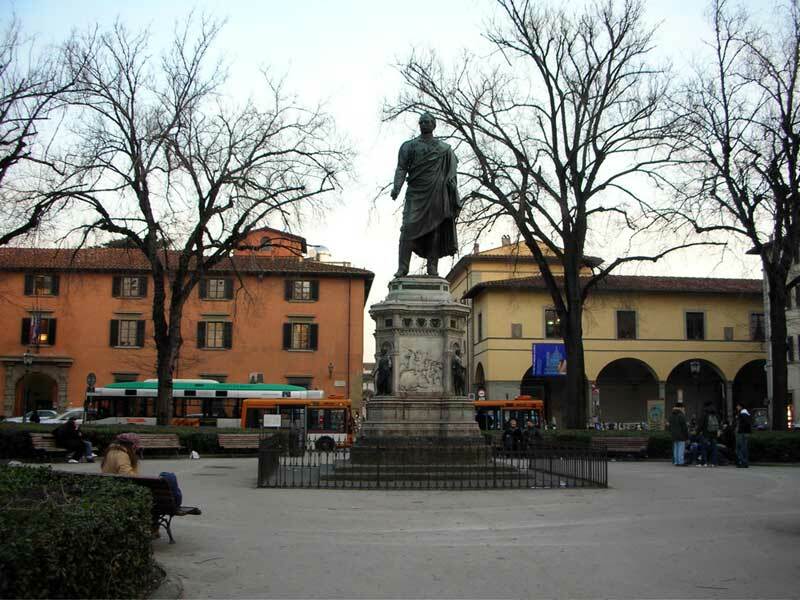 Monday is the day I usually can't wait to go shopping at the mercato di Sant'Ambrogio. I try to avoid going to the market on Fridays and especially Saturdays. Larger crowds of people and exhausted shopkeepers don't make for a pleasant experience. After living in Florence for over a year, I realized that I hadn't really visited many of the museums. I had visited most of the museums when I first arrived in 1997. I keep thinking that I have all the time in the world to visit the museums and then somehow I never seem to get around to doing so. Dave and I became members of the "Amici della Galleria degli Uffizi" and received a tessera (membership card), which gives us free entrance to the Uffizzi and all the state museums in Florence for one year. 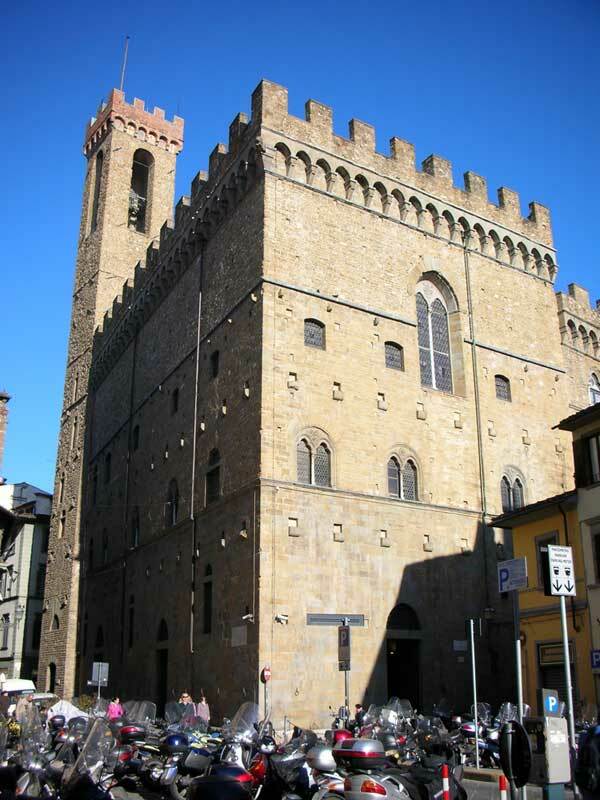 And today, I decided to go to Museo del Bargello in via del Proconsolo. I love the movies. I love everything about them. And, I especially love going to the theater to see them. This afternoon, we went to the Odeon to see "Rumor has it..." At the Odeon, they show three different movies a week: Monday, Tuesday, and Thursday. We already came to the theater on Monday and went again today. Although Dave went on Tuesday by himself as I couldn't bring myself to watch "A History of Violence." I have walked past the mosaici (mosaic) shop behind the Duomo a few times since we got back from California looking for Martina. The guys that I ran into near Piazza Pitti back in October told me that my friend Martina worked at this mosaici shop. Today I went to go see my friend Simone at his restaurant. I hadn't seen him since before Christmas and he's been so busy at work and teaching cooking classes that he hasn't had any time to swing by our apartment. I walked into his restaurant and could smell his famous p�t� with orange rind that he usually offers his customers as an aperitivo (appetizer). 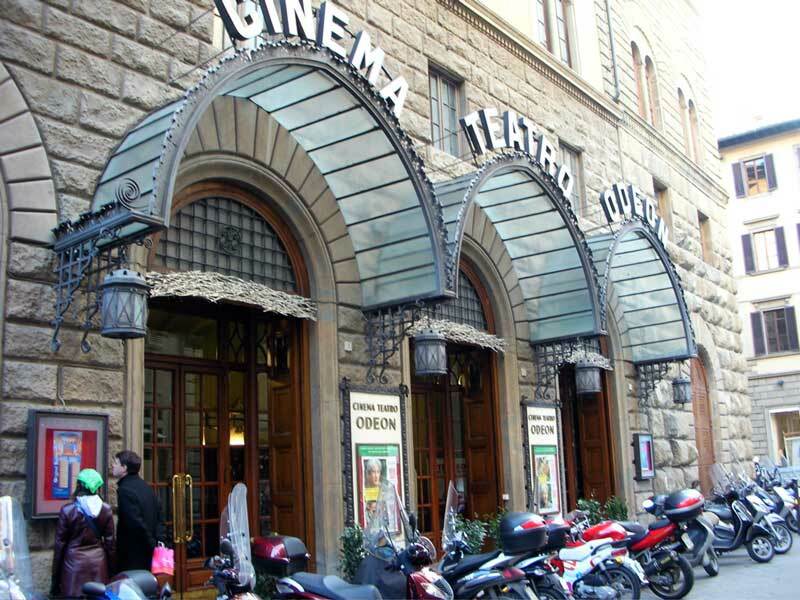 Dave and I finally got to go to the movies here in Florence this afternoon at the Odeon (the only theater in Florence where they play the movies in English). They haven't been showing any English (or as they say "Original Sound") movies since before Christmas. It's highly unusual that a movie theater is closed during Christmas time since that is when so many new movies start playing. 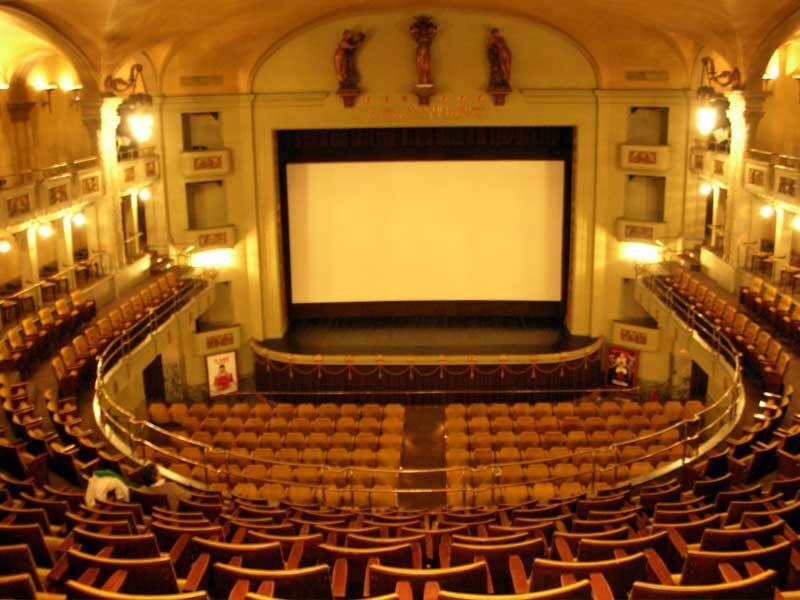 During Christmas time, Italians go to the movie theaters in droves. 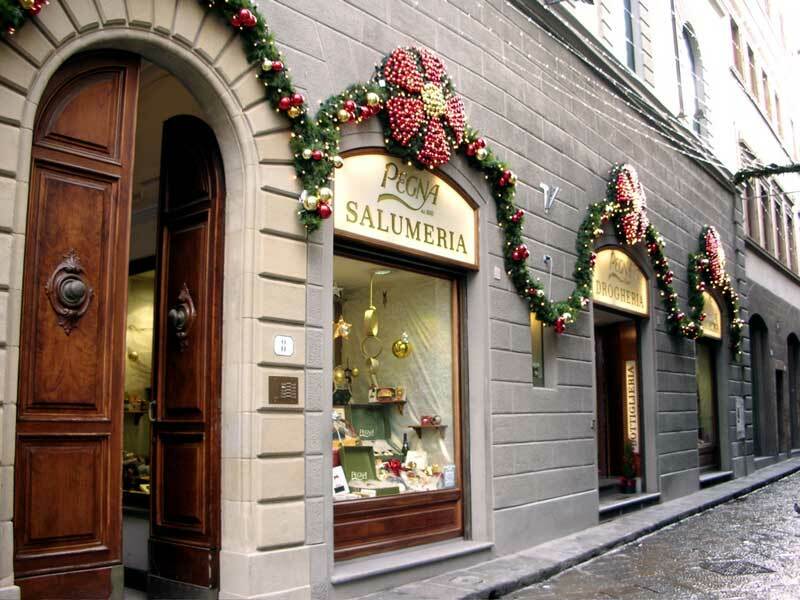 Starting today for the next two months, saldi (sales) will be the one word on every Italian's mind. The word "saldi" is written in every shop window everywhere. The saldi take place twice a year: once in the winter, called the "saldi invernali" and once in the summer, "saldi estivi." Today is the Epifania (Epiphany), which is the last holiday of the Christmas season and finally signals the beginning of the New Year (which will be Monday). Last night, supposedly a very old and scary looking witch, named La Befana, came by each of the children's house on her broomstick to fill up their stockings with either candy or carbone (coal) depending if they were nice or naughty. I've been planning on getting us our carte d'identit� (identity cards) for weeks ever since we finally claimed residency in Florence last year. We had to wait until we got our new permessi di soggiorno (permits to stay), which we picked up in November after we got back from the States. We really have no good reason for getting our carte d'identit� except that we can...and they are valid for 5 years! The carta d'identit� is used a form of identification in Italy, so we won't need to show our flimsy permessi di soggiorno any more. If you've ever been to Paris, one of the most exquisite places to visit is Fauchon in Place de la Madeleine. It is a well-known gourmet shop where you can purchase a wide variety of French delicacies. We have a smaller equivalent to Fauchon in Florence and it's called Pegna. They are even a purveyor of a small selection of Fauchon items. In the past, when I have moved someplace new, the one thing I always searched for was a place to buy Asian ingredients that I use to cook some of my favorite dishes. In Paris, it was quite easy because of the many Vietnamese. 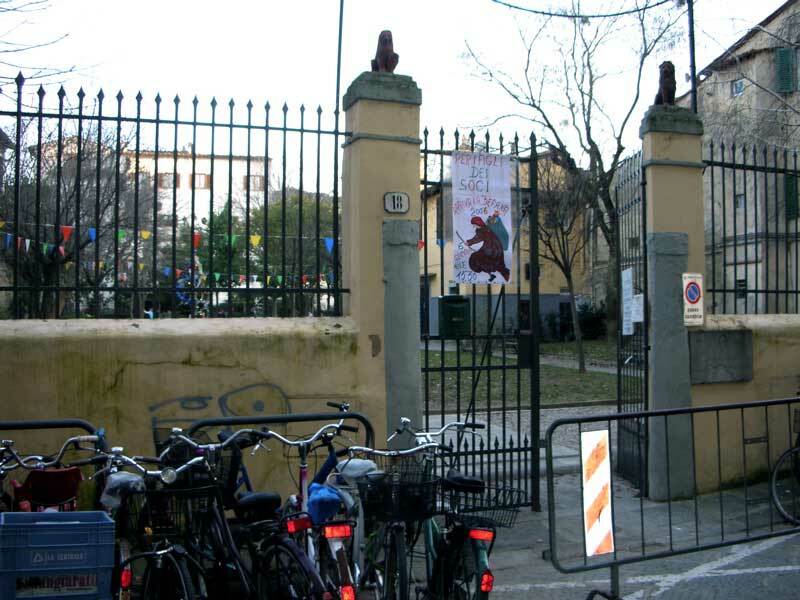 In Florence, the Vivimarket is in via del Giglio, which is a narrow street behind the San Lorenzo church leading back to the stazione (train station). This morning we woke up to rain (as well as a few more SMS from my friends, wishing us a "Buon Anno!"). Some might think that it's not the best weather to have on January 1st, but for us that means that it's not as cold outside! The snow has finally melted away since it first fell on Wednesday and we didn't wake up practically shivering at the sight of the snow outside.